Hi everyone! Today's review is a bit different, because it's more of a travel guide (my first one!). This one is very special to me because it's where I got engaged! Today is Dan's birthday, so I thought it would be a perfect post for today. I'll be telling you about where we stayed, where we ate, and what we did, as well as our engagement story. Since this was a beach trip, we spent a lot of our time relaxing. Future travel guides will have much more information! It’s helpful to know when choosing a location that locals commonly divide the area into three main sections: the Northern Beaches, consisting of Duck, Southern Shores, Kitty Hawk, Kill Devil Hills and Nags Head; Hatteras Island, consisting of Rodanthe, Waves, Salvo, Avon, Buxton, Frisco and Hatteras; and Roanoke Island, consisting of Manteo and Wanchese. For our trip, we stayed on the Northern Beaches. The hotel was in a great location, and we had no problems with the room, and the staff was very friendly. We got a beach-front room which was absolutely beautiful- you can see our view above. I would recommend the hotel if you're looking for a simple, no frills place to stay. This place was awesome! The whole atmosphere was really relaxed and fun, and it's actually the first wind-powered brewery in the United States. I tried a flight of their beer, and everything was fantastic. We got to sit on the second floor, and view was great! They also host weddings here, which would be a really cool venue! We tried out a lot of different custard and ice cream shops, and this one was the winner. The custard was really rich and creamy. Delicious! I also got a Coney Island hot dog, which was fantastic. There was a long wait to order food, so you know it's popular. If you're looking for a fancier place to eat, definitely check out Colington Cafe. The restaurant is in an old Victorian house, far away from the touristy areas. They have some beautiful rooms and gardens around the property. Their wine list was great, and the food was delicious! If you're planning on eating here, reservations are suggested. Every beach has to have a great boardwalk, and this one is excellent. It does cost a few dollars to enter, but the view is great! There were a bunch of people fishing when we were there, and we just relaxed for a while on the pier. There's a small museum inside the building as well. We spent one day at the Audubon going on a stand up paddleboarding tour! It was so much fun and really easy to learn. We were the only two on the tour, so we got to go all over the place with our guide! It was really easy to learn how to paddleboard, and in no time we were paddling like pros. The area is protected and was full of all kinds of animals. It was really beautiful, a lot of fun, and a great workout. If you've never tried SUP, I would highly recommend it this coming summer! This place was so cool! It was a gigantic sand pit. The views were incredible, and we even got to watch a few sunsets. It was insane walking over huge sand dunes, and I bet it would be a ton of fun with a dune buggy! I would highly recommend making the trek to check out the tallest natural sand dune in the Eastern United States! I've never seen anything like it. Now on to a more personal part of the trip...the proposal! Every morning, Dan would wake me up to go to the beach to see the sunrise. On the final day we were staying, he woke me up again and said he would meet me down there. To be honest, I was so tired and didn't feel like going down to see the sunrise - again - and almost stayed in bed. Thank goodness I changed my mind and went down! At that point, I was wide awake! I could feel my heart racing and couldn't stop smiling. Dan handed me the bottle that was in the middle of the heart,which had a message inside. Once I was done reading it (to be honest my adrenaline was pumping so much that I didn't actually read it..I couldn't focus or think straight, so I had to pretend to read it), Dan was on one knee and asked me to marry him. I said yes and grabbed the ring and put it on (I blame being delirious from lack of sleep). 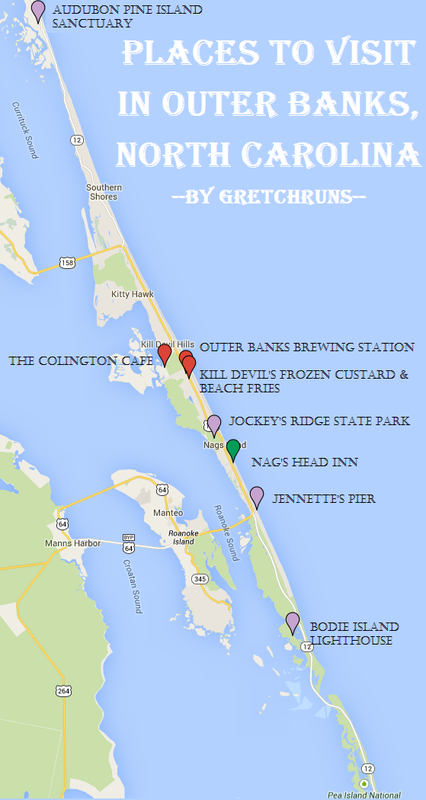 I hope you enjoyed this review/guide of the Outer Banks! It was such a fun trip, and one that will be impossible to forget. I'd also like to wish Dan the happiest birthday! 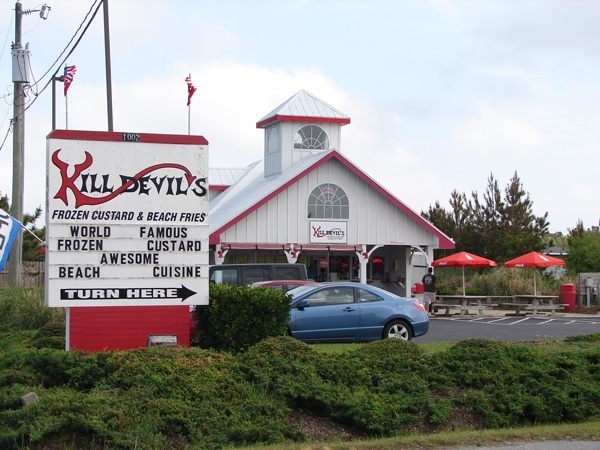 Have you ever gone to the Outer Banks? Does anyone have a fun engagement story? I'd love to hear! I loved your proposal story! Very creative! And I loved the three signs that came right after. Happy birthday to Dan! How romantic! He is such a sweet guy. We are so happy to have you as part of our family!